Collins Booksellers - Shiok! by Terry Tan & Christopher Tan, 9781462917785. Buy this book online. This beautifully illustrated Singapore cookbook features 100 delicious recipes and simple, clear directions. By every account, Singapore is home to some of the best food on the planet. This tropical island is a veritable cauldron of cultures and culinary traditions, and "shiok!" - a local expression loosely meaning "Wow, delicious!" - succinctly sums up the experience of sampling Singapore's best cooking. This book of Singapore recipes is a veritable compendium of beloved local classics, including the most fabulous Chicken Rice and Chili Crab you will have ever eaten, as well as less common but equally delightful dishes, such as Ayam Tempra and Nasi Ulam. 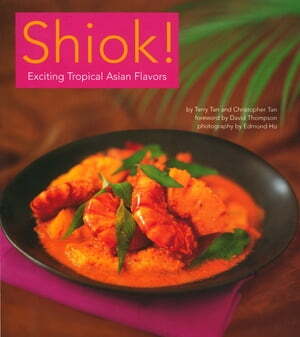 These recipes are well written, easy to follow, and accompanied by clear color photographs. The reader's acquaintance-or re-acquaintance-with Singapore food promises to be an exciting and mouthwatering experience.